I have said before that I have a thing for Victorian home decor. I plan to dedicate my front room (which I call The Library) to this look. While I am still searching for the perfect fainting couch and side table, I have found some lighting. Through eBay I found a great lamp for said side table that is bronze and silver and very period-looking. I also found the perfect light fixture. While snowed in today, I put it up. During the weekend, I went to a magical place called Second Chance, Inc. in Baltimore. It used to be a steel mill, but now it is a DIY-er’s dream come true. It is about two square blocks of reclaimed EVERYTHING. From appliances to flooring, they have whatever you can think of. They had everything from reclaimed floor board to antique Gothic chandeliers salvaged from a cathedral in PA. They even had church pews! I don’t know what I would do with one, but I want it! I went in there with a friend who was helping me fix my dishwasher. He determined I needed a new one, so off we went to Second Chance. While frolicking in there (he does major home improvement projects, so he was in Heaven with me), I found some antique lighting. 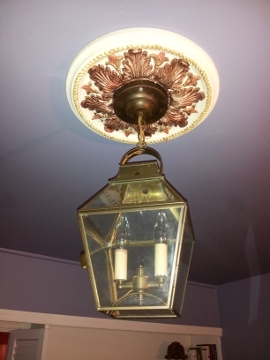 I got this wonderful 4-sided brass ceiling fixture for $12!! It is from Heritage Lanterns, which is a small company in Maine form what I can gather. As soon as I saw it, I knew it needed to go in The Library. But, it couldn’t go alone. I did some more research and found that most lights in Victorian days had ceiling medallions above them. So I went to Home Depot and then to Michael’s Crafts to get what I needed to make a really awesome medallion. Home Depot sells the for around $30. While this was more than the lamp, I wanted to complete the look. So I grabbed a 14″ Westinghouse Bellezza Ceiling Medallion (#77750) then went over to Michael’s to grab some metallic acrylic paint. 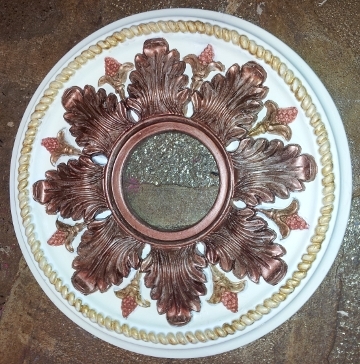 I used FolkArt brand in Antique Copper, Antique Gold and pure Gold. For the berries, I also mixed in some Craftsmart Brick Red paint. I painted the whole thing Craftsmart Buttermilk first, so it was not pure white. I let the metallic paint dry, then touched it up with the Buttermilk paint and off I went to hang it up. I used Liquid Nails for paneling to put it up. It stuck on without the need to nail it up. I let it dry for a few hours and wrote some more of my report for work. Then I hung the lamp. I shined it up first and then went to work. I needed to shorten the chain on it so it did not hang too low. But after a little bit of work and some cursing, the light was up! The fixture itself looks great, but it looks amazing with the medallion behind it, if I do say so myself. Not bad for a snowy day!